The oversize master suite overlooks the backyard and offers wonderful mountain views, spacious master walk-in closet, dual sinks, glass stand-up shower & relaxing soaking tub. Pool home on a quiet cul de sac in the heart of Murrieta. This stunning and spacious 3000 sq/ft home features 5 Bedrooms, 3 Full Bathrooms, 3-car attached garage with a large bedroom and full bathroom on the first floor. As you enter this amazing home you are met with hardwood floors, spacious formal living room and dining room with neutral paint & ceiling fans throughout. Open kitchen floorplan with ample cabinet and counter space, large center island and tons of natural lighting. Family room has a brick fireplace and breakfast nook that has direct access to the beautiful pool & spa backyard. Perfect backyard for family gatherings, bar-b-ques & swimming pool fun. Make your way upstairs where you will find 4 more spacious bedrooms including the very large bonus room with ceiling fans throughout, built-ins, media room, and hardwood flooring. Additional features include mature lush greenery, epoxy flooring in garage and tons of custom built-in in the cabinets within the 3-car garage. 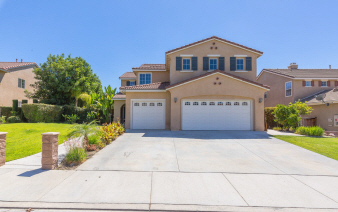 This beauty is Located near freeways, shopping, restaurants, and Murrieta's finest schools coupled with low taxes & NO HOA. Solar will be paid off with purchase. Don't miss this one!